For local horse racing enthusiasts, yesterday’s 48th meeting of the season will remain a memorable and historic experience. Queen Elizabeth paid a visit to the Marsa Racetrack yesterday and during her short stay took part in the ceremony of the Class Silver final that carried her name. It is a well-known secret that the Royal family always had a passion for the sport of horse racing and in the 1950’s the Queen had also visited the Marsa Racetrack during her visit on the island. Twelve trotters took part in the silver final. Favourite Royal In dashed strongly from the outside with 400m to the end of the race and secured its fifth win in a row and ninth of the season, finishing ive lengths off Zizazimoko (Tony Demanuele). L.A. Tromb (Rodney Gatt) and Maillot (Clint Vassallo) followed home in that order. 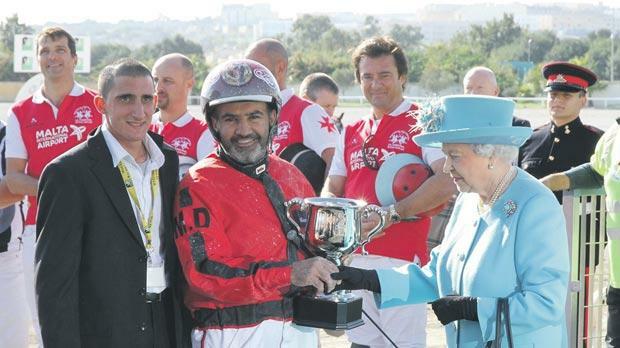 At the end of this final, Queen Elizabeth II presented the winning cup to Marco Debono, co-owner and driver of the winning horse. Yesterday’s programme also included two semi-final races from the Prix De Cagnes Sur Mer for French trotters registered in class Bronze. From the two class Bronze semifinals 12 horse qualified for the final. In the first semi-final, early leader Tasco (Shaun Portelli) ran out of steam midway through the final straight and was outsmarted by Saphir Merite (Joseph Scerri) which gained its second win of the season from Picabia Des Audins (Brian Hili) and L’Ideal De Fersan (Ian Galea). Record Du Stade (Charles Camilleri) and Polytain (Noel Baldacchino) also progressed to the final. Saphir Censerie (Kurt Saliba) led all the way throughout the 2,640 metres distance of the second Prix De Cagnes Sur Mer bronze class semi-final. This French nine-year-old trotter grabbed its first win in Malta after beating the challenge of Pittacos (Noel Baldacchino) midway through the final straight. Qumran De La Motte (Frencu Cassar), Voila Dry (Ivan Bilocca), Quad De Beauregard (Emmanuel Fenech) and Roc Magister (Kirsten Axisa) followed home in that order. Another meeting, consisting of ten races all for trotters, will be held today at the Marsa Racetrack. The first race starts at 1.15pm.